A warm welcome to Ashley Ardagh, RMT and Elise Bradwell, RMT who joined the Bloom team over the last several months. 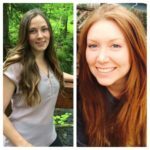 Many of you have already met these two talented therapist and we are excited to be able to offer you massage services 7 days a week. Use up the last of your extended health benefits and book online here. We also recently said Goodbye to our Naturopath Dr. Ayla Wilson, ND who has relocated her practice to her own space in Vancouver. We wish her all the best in the future!